If you have attended or otherwise watched my talks about earthquake preparedness, you know that I make a point about not running out of a building during an earthquake. I know, it just seems like the thing to do, when everything is shaking around you, and you picture yourself trapped under pancaked and collapsed buildings. But the point I make in my talks, and want to emphasize with a bit more discussion here if you read further, is that at least in modern industrialized nations, statistically, you are taking a bigger risk of being injured as you run from your nice strong building into the DANGER ZONE that exists right next to buildings. While the structure is designed to remain intact, lots of less-secure parts of the building are attached on the outside with much less thought (or attached with nothing BUT thought…), waiting to come crashing down as it shakes (bricks, window glass, ornamental masonry, signs, etc.). From what I hear, most injuries from earthquakes in places like California are sustained by people getting hit by the OUTSIDES of buildings, not the insides. 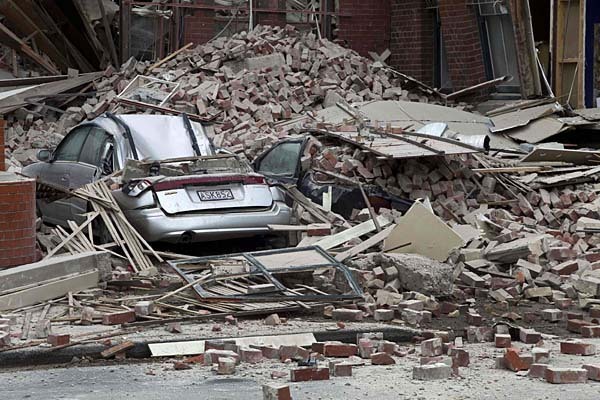 The Pyne Gould building, for example, showed up a lot; amazing collapse; check out these photos (from AFP/Getty Images through newsfeed.time.com, and National Geographic). Of course, I’m guilty of this also in my talks; when I show notable damage from the Northridge quake for example, I show a collapsed department store, a collapsed apartment building, and a partially collapsed parking structure; and I guarantee you that I did not randomly select a cross section of the typical damage! I went for the photos that make the biggest impression, and then of course I have to mention to people that most of the damage didn’t look like that. If I knew for a fact that the building I was in was going to completely collapse, I might be tempted to try to get out; but of course we can’t know this. Our buildings’ structural supports are much stronger than their “skins”; the outer walls and windows and all the trimmings. 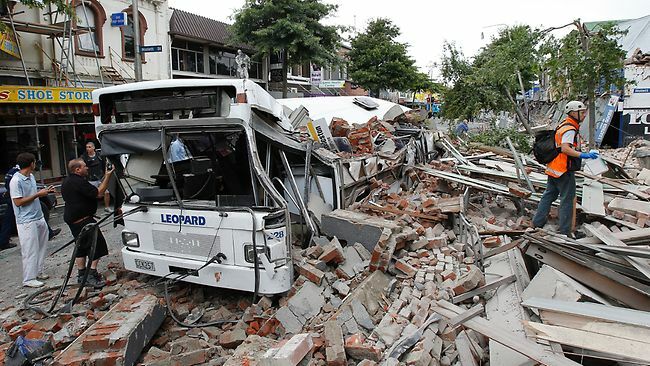 Even if the building does not collapse, those outer walls still can collapse and they tend to collapse outward. During a large quake, I’d be happier in an open field than inside a building, but where I want to be the least is next to buildings for those reasons. In fact, I’ve heard that there is no safe place to be outside in a city downtown area, where any skyscraper window glass that dislodges can sail diagonally like an airborne machete…and I suspect that if I were on the streets of San Francisco’s Financial District, I might just be running into a building while everyone else is running out of it! 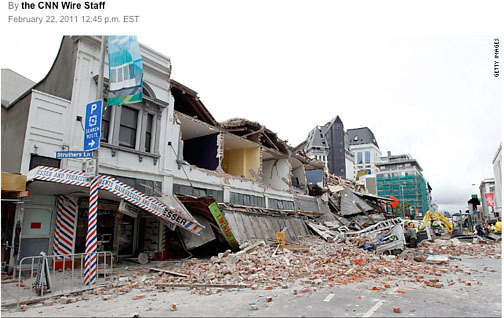 Speaking of which, I will now show a photo or three and say “see, this proves that being next to a building CAN be a pretty bad idea.” These photos from Christchurch came from http://thesun.co.uk and from CNN and are all over the web with numerous attributions. (I am focusing on Christchurch rather than Japan because the Japanese tragedy was compounded by the tsunami and it seems most of the damage photos are tsunami-related; it’s difficult to know when photos of rubble are entirely due to the quake itself.) I also think these photos are a good illustration of why it is not automatically a good idea to be NEXT to an object during a quake (think back to my article posted a couple of months ago about the Triangle of Life spam e-mail). At any rate, I wish there was an iron-clad rule: “do this and you will be fine.” Unfortunately, all we can do is play the odds. 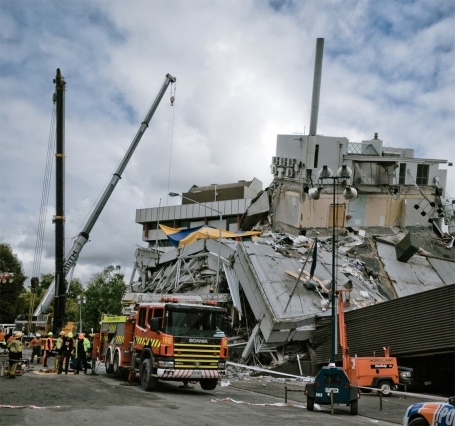 Back in Christchurch, in the collapsed Pyne Gould or Canterbury TV buildings, well, I would NOT want to be inside those buildings. The much publicized ordeal of the woman who was trapped in the building and called her family to tell them she was probably not going to make it before being rescued a whole day later, and her co-workers who indeed did not make it, make us feel like clearly we should get out in case the building collapses; but people who ran out of non-collapsing buildings only to get buried underneath the rubble of the outer walls collapsing into the streets would have been better off staying inside. How many of us know someone who says that if they HAD been wearing their seatbelt, they would not have been thrown free of the car wreck before it exploded, etc., but we still (hopefully) wear our seatbelts because it gives us the best odds of being protected from harm. To me the safest strategy to consider ahead of time if inside a California building in a large quake is to plan on finding a relatively safe spot under a table and to hope that my building won’t be one of the rare buildings to completely collapse, unless I have reason to believe in that specific instant that the building really is going to collapse. I’ll follow the plan that might hurt me in 1% of the possible outcomes and will save me in 99% of the possible outcomes (again, numbers are just for illustration). And the next time I get in my car and I’m about to put on my seatbelt, I might have a brief moment of uncertainty, but then I’m pretty sure I’ll buckle up. Interesting read. I agree with what you say in regards to buildings in California. However, the situation is very different in Portland, OR. 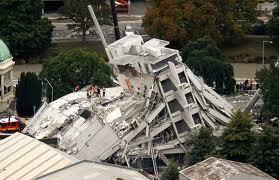 There's been little to no seismic retrofitting and only buildings built 1995 and on will stand a chance. On top of that, the quake will likely be bigger than what California deals with. Doesn't look good for us up here. In my case, I think I have less than a minute to escape the perimeter of my two-story structure before bricks start pelting everything below. Best chance: I think I'll have to grab my go-bag and put a helmet on and hope for the best, but chances are I'm a dead man. Thanks for the comment. It's always a tough call, as I discussed in this article and also you might want to check out the further musings in my 4/25/15 article. I especially stressed in that later article that there's no perfect advice here; we are just trying to minimize the odds of a problem. Importantly, and I like to repeat this whenever I can, if everyone follows the advice that will save the most people, some of them won't be saved and they might have been saved if they hadn't followed that advice. However, if everyone does the opposite, then more people won't be saved. The tough decision is to decide what advice it is that really saves the most people, and under what circumstances to disregard that advice. 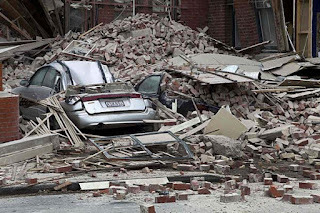 If you feel that your building won't withstand a large quake, then you may have a more compelling reason to behave differently, although keep in mind that if half of the buildings collapse, many of those that don't will probably have outer perimeter failures like those described here and it is hard to predict which will actually fall. Thank you for this article and your blog!